There are days when you wake up and do something that will make the whole day better. Such as filling your slow cooker with ingredients, setting the timer so that it kicks on whilst you’re out and that by the time you get home: Dinners Ready! I must come clean though, whenever I leave the Crock-Pot and I’m not home I do worry that I might burn the place down. In fact, I know quite a few people that are so freaked out they run their slow cooker on the garage floor or outside on the terrace. I try to use mine as safe as possible; I place it on the granite island with nothing near it. It’s also plugged into a GFI plugin, so if there is any electrical problem it would be tripped. I also do not have cats or dogs, so there’s no risks about an animal climbing near it. Still, I worry because I do not trust technology that much...and yes, I’ve suddenly realized I’m becoming my grandpa! Anyways, yesterday morning I made this glorious carne guisada. For those of you not familiar with it, carne guisada (which translates to “stewed meat”) is a very savory, a tad spicy stew. Chunks of lean beef are slowly simmered with tomatoes, bell pepper, onion, garlic, and spices to make a rich spicy gravy. I often order carne guisada when I go to Mexican restaurants, it is an incredible fulfilling meal, hard to beat on a cold day. 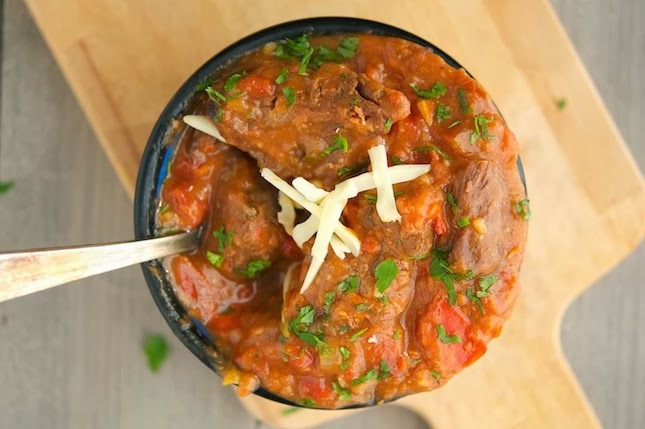 This carne guidasa is delish - I know I say this about all of my recipes but trust me on this one. The slow cooker does all of the hard work all you have to do is sit, relax, and let the magic happen. It all starts with a two-pound beef chuck roast, cut it into one-inch cubes. I then chop up onions, garlic, bell pepper, chile; sear the beef; saute’ the vegetables with the spices and then throw everything in the Crock-Pot with diced tomatoes, broth and bay leaves. In 6 hours the slow cooker turns beef chunks into melt-in-your-mouth tips and the gravy gets so amazingly thick. Carne guisada can be a meal in itself, served in a bowl with cauliflower rice. You can also wrap it up in gluten-free (or cauliflower) tortillas for tacos, and the leftovers can be a hearty topping on a pile of scrambled eggs, for a power breakfast. But without further ado, here’s is my recipe. Easy Healthier Crock-Pot Carne Guisada Print this recipe! Heat one tablespoon of olive oil in a large skillet over high heat. Cook beef (in one or two batches) until browned on all sides, about 5 minutes. Transfer browned beef to a slow cooker. In the same skillet, heat remaining one tablespoon of olive oil. Add onion, bell pepper, jalapeno and garlic, and cook stirring and scraping up browned bits with a wooden spoon, until vegetables are tender, about 5 minutes. Add cumin, chili powder, and arrowroot powder and cook for 1 further minute. Slowly pour broth into the skillet, stirring until liquid is smooth and then transfer to Crock-Pot, along with tomatoes and bay leaves. Cover and cook on medium-high for 6 hours. Serve sprinkled with chopped cilantro and with grated cheese. One serving yields 451 calories, 33 grams of fat, 6 grams of carbs, and 31 grams of protein. I made this today and it was fantastic! I live in Texas so we eat a lot of carne guisada, the flavor was spot on and still works with our paleo lifestyle. I cannot thank you enough for this recipe. The first time prepping takes about 30 min so if you want to throw things quickly in the crock pot I would do some dicing the night before. 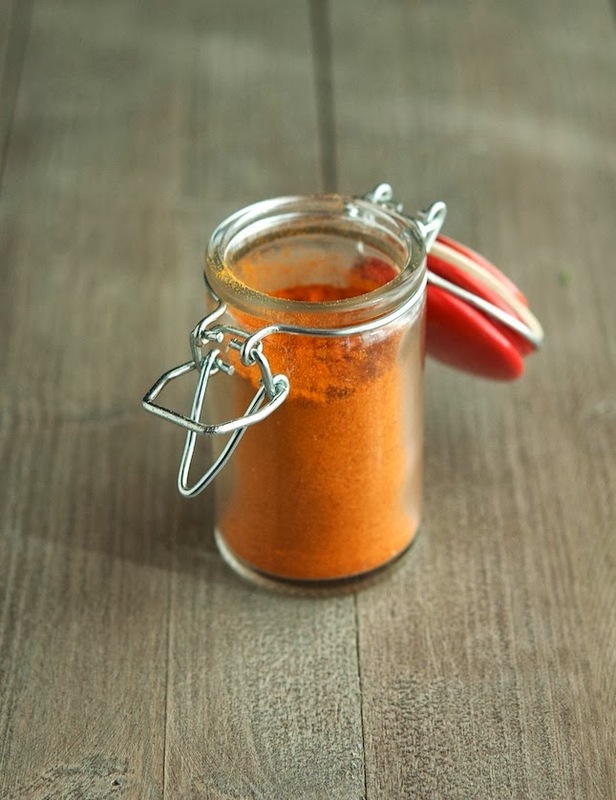 We also used just one medium sized fresh tomato diced, worked just as well. Oh wow, that looks like something I could totally make this weekend. Thanks for sharing! I love a good crock pot meal and this sounds so flavorful and delicious! And I thought I was crazy for obsessing about the crockpot being on whilst I'm away! 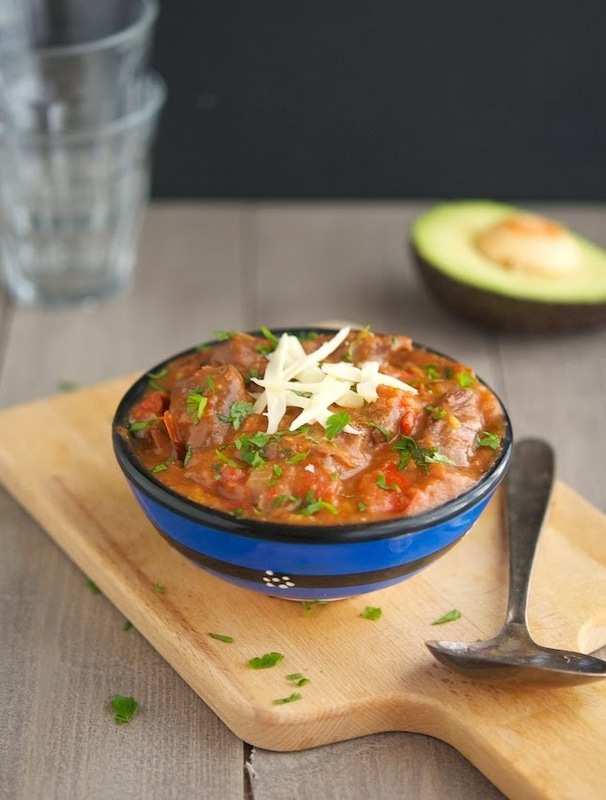 I've never had carna guisada before: looks awesome and it's made in the crockpot - what am I waiting for? I'm starting to believe everybody freaks out about leaving a Crock-Pot on unattended. We're definitely not the only ones J! Haha! This post made me laugh! I am always paranoid that I've left something on at my house (stove, oven, etc.) and have (multiple times) driven out of my driveway only to turn right around and double check said appliances. Thanks to you, I'll probably be second-guessing the crock pot from now on...but you are forgiven thanks to another great recipe. :-) Cheesy, I know! We are all becoming our mothers, fathers etc, Mine is the garage door opener, did I close it? yuck! anyway this looks fabulous, my husband would love this. What about house keys Cheri? Since we are all in a confessing mood....I confess I only run my crock-pot when I am home! Your carne guisada sounds wonderful Mike! Any dish where its "hard to tell where the meat ends and the gravy begins" might have me (anon beef eater) digging in! 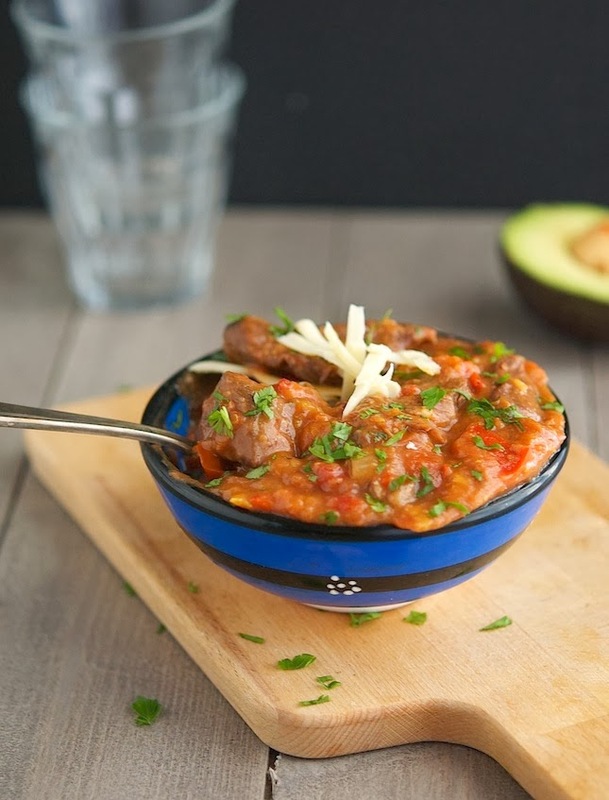 With or without the cheese, this carne guisada is uber awesome! Loving all the flavors in this Mike! And I used to be super afraid of leaving the slow cooker as well... I still make sure to use a GFI outlet and clear any possible flammable stuff out within like a 6 foot radius haha. OOOhhh Wow, all the way from Chilly South Africa, and this looks Amazing. The Man would love this and I can take points for "cooking" for 6 hours LOL. Ps~ I also can not leave my clow cooker unattended, Nightmare material! Where did you get the spice jar? This recipe was decent... Mine didn't thicken as much as I would have liked. I served it over cauliflower rice with salsa verde, very tasty! I made this on the stove last night and my family raved!! I upped the spices by about double and used two jalepenos, one whole bell pepper. Took about two hours on the stove and the meat was very tender. Thank you!! !